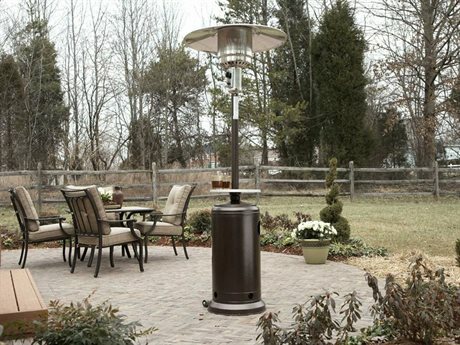 Offered in diverse styles and types, patio heaters produce heat to safely warm a defined outdoor area. These appliances make a perfect addition to any patio set, as they create a more comfortable environment, and generally feature sleek and simple designs for a compact and unobtrusive appearance. 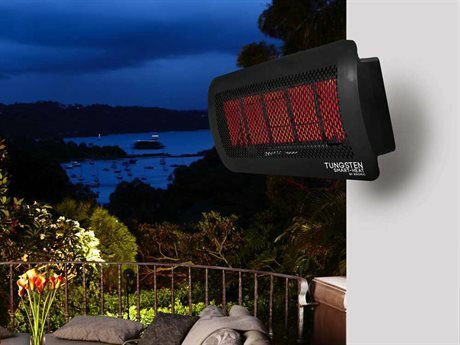 Outdoor heaters can be used in many climates and appear well in both residential and commercial settings. Heaters provide cozy warmth on cloudy days and also make various patio spaces suitable for usage well into the brisk fall season. 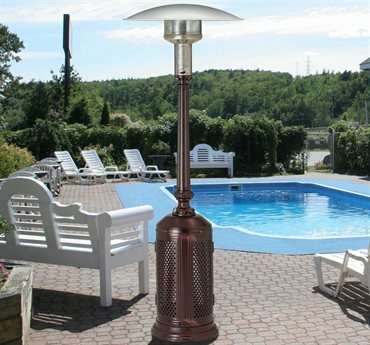 PatioLiving offers a diverse inventory of patio heaters, with options to appeal to differing needs and style preferences. Our selection includes both propane and natural gas fuel-powered options, as well as energy-efficient infrared models. Heater brands available through PatioLiving include Sunpak, Sunglo, and others. Patio heaters are generally powered by either natural gas or propane. Propane heaters include a gas housing unit for discrete storing of an appropriately sized propane tank. These heaters are relatively portable, and can be moved on patios or decks. Natural gas heaters are generally permanently connected to a natural gas source, and do not require the manual restocking of fuel. Both natural gas and propane heaters directly heat the air over a defined radius that ranges from under 10’ to 20’ or larger. Infrared heaters are distinct in how they emit heat. 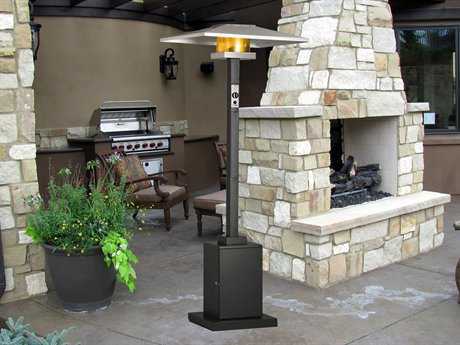 These types of patio heaters are powered by either propane or natural gas, but instead of heating the air, they utilize infrared technology to directly warm objects in the direct vicinity, such as furniture or people. 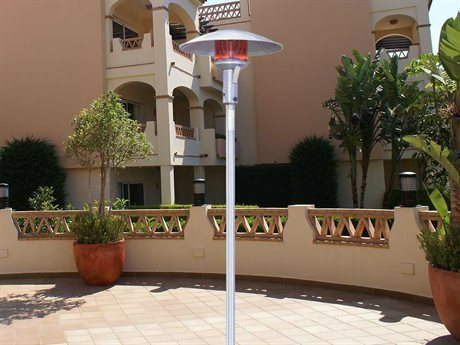 Patio heater units vary in appearance and application, with different styles being more appropriate to particular settings. In compact or cluttered spaces, a mountable slim heater unit can sufficiently provide heat to the direct area without disrupting an existing furniture arrangement or diminishing limited patio space. These models can also be situated high out of reach, creating an added level of safety when operating mounted heaters. Standing units can include decorative elements and striking modern designs, suitable for incorporating into any contemporary aesthetic. These types of heaters are popular in commercial venues, such as restaurants or resorts. There are also tabletop heaters, ideal for being placed on a dining table or coffee table to heat your guests while dining or relaxing. 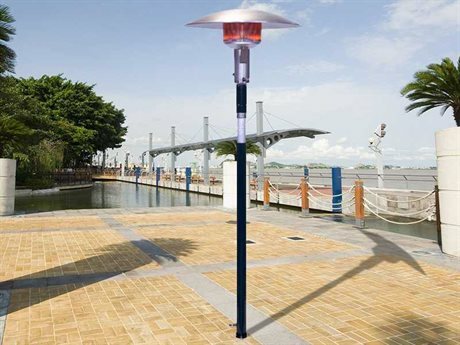 Outdoor heaters are manufactured from heat-resistant, durable materials, such as steel and bronze. Outside heaters are valuable warming appliances that bring both functional and decorative value to various outdoor settings. Unit styles can range from traditional to contemporary, with slim mountable units also available for a discrete look. Many models include standard safety features and functionality mechanisms for maximum safety and ease of use. Select patio heaters feature wheels, latched gas supply cabinets, ON/OFF power switches, remote operation, safety tilt features, safety burner screens, and burner covers. 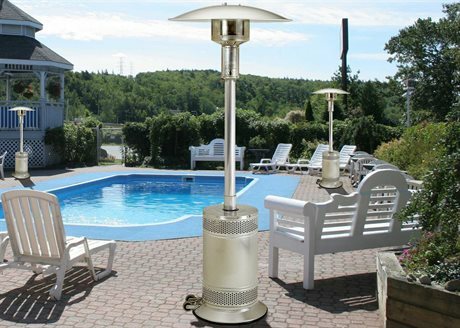 Constructed from durable stainless steel and bronze, many heaters are weatherized for resilience to damage from outdoor elements. Select standing units include weighted bases to remain stable in strong winds. Most heaters are available in several finishes, making it easy to find a heater that coordinates with any existing patio aesthetic. 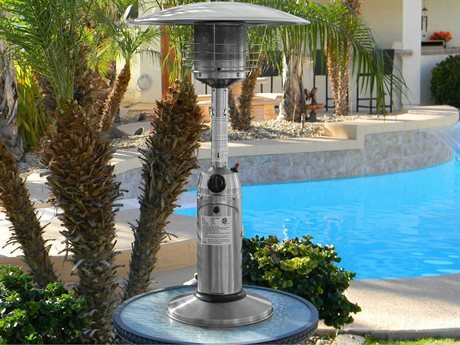 To learn more information about patio heaters, read PatioLiving's Patio Heaters Buying Guide to learn more about the different types of heat, styles, sizes, and features that are best suited for your outdoor living space.